Once you define your conversion, you can calculate your conversion rate. A conversion rate is the percentage of website visitors that complete the defined call to action. If 100 users visited your website today, and 3 of them clicked on the phone number link to your office, your CRO would be 3%. A good conversion rate varies depending on company goals, and allocation of resources. 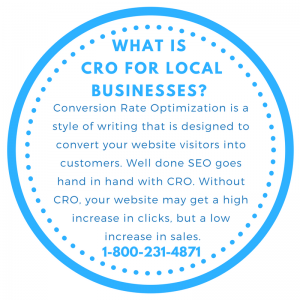 To discuss CRO services from Dallas / Fort Worth SEO, give us a call at 800.231.4871. Search optimization returns the favor by improving conversion rates. Generating relevant traffic and providing them with an optimal user experience increases the likelihood of a conversion. As you can see, each concept feeds off one another, and together can drastically improve website performance. If you are a business owner in the DFW Metroplex, our services can enhance your digital marketing campaign in 2018. If you’re a Fort Worth, TX business owner looking for conversion rate optimization services, you have come to the right place. DFW SEO is the #1 CRO service in Dallas, TX, Fort Worth, TX, and the surrounding DFW Metroplex. We employ a team of elite web designers, as well as a group of highly skilledcontent writers. As a result, each of our clients website’s prosper within their industry and local community. Tired of being locked into long-term agreements before seeing results? DFW SEO eliminates long-term contracts, and offers month-to-month service agreements, so that business owners can constantly evaluate our performance, and hold us accountable for results. Our choice to offer month-to-month agreements is based on our self confidence. We know our marketing services are elite. Call 800.231.4871 for conversion rate optimization services in Dallas / Fort Worth, TX. Updated on March 19, 2018 at 8:43 pm by Dallas / Fort Worth SEO.